Unfortunately, stress and anxiety go hand in hand. 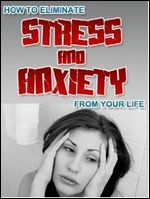 In fact, one of the major symptoms of stress is anxiety. And stress accounts for 80 percent of all illnesses either directly or indirectly. In fact, stress is more dangerous than we thought. You've probably heard that it can raise your blood pressure, increasing the likelihood of a stroke in the distant future, but recently a health insurance brochure claimed that 90 percent of visits to a primary care physician were stress-related disorders.